Award winning wine writer Sarah Ahmed reports on the Duas Quintas 25th Anniversary Vertical Tasting of Douro DOC Whites on her website, The Wine Detective. Duas Quintas, of the famous Port House Ramos Pinto, produces exceptional dry wines from the Ervamoira and Bons Ares vineyards in the Douro Superior region of Portugal. Sarah Ahmed writes that Duas Quintas “helped to forge the modern era of Douro wines and Ports” by being the first winemakers to block plant (i.e. in single varietal parcels) and vertically plant their vineyards. 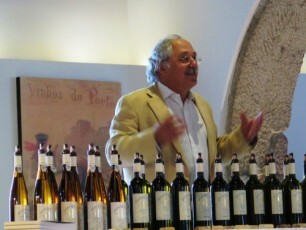 As well as pioneering these techniques, Duas Quintas’ Chief winemaker João Nicolau de Almeida has been exceptionally successful. In fact, when describing the 25th Anniversary vertical tasting he went so far as to say: “my work is done”. Ahmed described the current vintage Duas Quintas Branco as: delicate toasty, nutty…with sweet yellow plum, green apple peel and hints of pastis/anise and lime zest which follow through on an expressive palate. It has the richness with delicacy which categorises my favourite Duas Quintas whites. A long, mineral lemony finish completes this stand out vintage. Contact Christine to find out more about these exceptional and age-worthy whites.